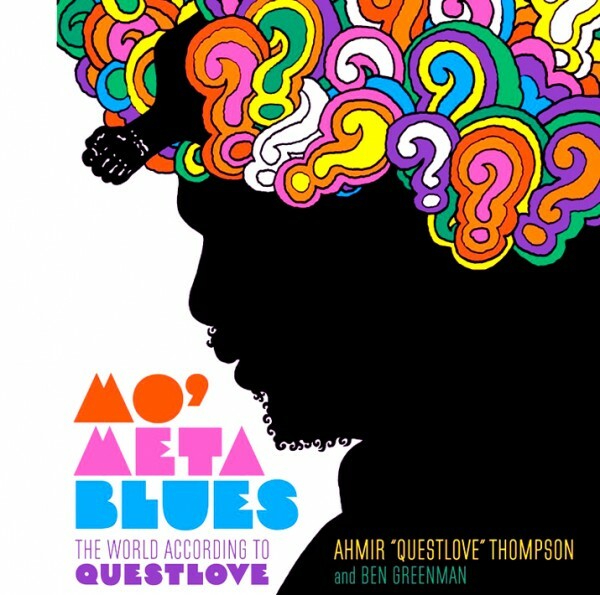 BY ADAM BISIGNARO As his nickname would suggest, Questlove has many questions –personal, rhetorical, and universal – to ask in his musically-driven memoir, Mo’ Meta Blues. These questions range from the crucial (“what’s the single most influential moment in the history of hip-hop?”) to the existential (“what is a death if not the confirmation of life?”). With a swing that wide, dude is clearly aiming for the fences. Assisting Questlove with these inquiries are some of the artists and celebrities – Prince, Dave Chappelle, Jill Scott – that he’s met on his way to the top as The Roots’ drummer and a globe-trotting DJ with encyclopedic ears and an alchemist’s touch. There would appear to never be a dull moment in Questlove’s life, though he argues otherwise — very convincingly, it should be noted. The throughline of the book is the ongoing clash between expectations and actuality — what Questlove imagined fame would be like and what it’s actually like, in real time. Hence the ‘Meta’ of the title, itself a pun on the title of a 1990 Spike Lee movie. Mo’ Meta Blues is brimming with star-crossed drama — rollerskating with Eddie Murphy, a confrontation with Puffy after Biggie’s death, and awkwardly hilarious encounters with Prince are just a few — but too often events are told rather than shown. As such, Questlove’s days of wine and roses begin to blur together. In three pages, we go from working with D’Angelo, to a random night with Q-Tip and Prince, to the release of Illadelphi Halflife. Even though these events are told in chronological order they feel like they are swimming in separate pools. Questlove seems to be aware that he is an unreliable narrator of his own life story. In footnotes, he allows Roots co-manager Rich Nichols to add his two cents about the events that Questlove describes. The resulting Roshomon effect, with Nichols contradicting rather than reinforcing Questlove’s recollections, makes the stories richer because of the multiple perspectives on the stories that unfold. Questlove is a walking jukebox. To him all the world is a stage in search of a soundtrack. So it’s no surprise that what was playing in the background at the time is the key that unlocks his memory. It’s 1979, he’s walking down Broad Street to the sounds of Stevie Wonder’s Journey Through the Secret Life of Plants. It’s 1982, he’s hiding Prince’s 1999 in his drum kit because his parents banned it from the house for its “profanity.” It’s 1990, he transposes his love for trains with the record shop where he bought Ice Cube’s AmeriKKKa’s Most Wanted. As a result, plot details often get neglected in favor of the atmospherics surrounding the action, leaving a lot of questions unanswered. I was hoping to learn what the hell songs like “Something in the Way of Things” is about or where “Complexity” came from, or how the current line-up came together. And we only get a faint whiff of the band’s dirty laundry and inner strife. Any memoir worth its weight delivers some behind the scenes dirt and Mo Meta is stingy in this regard. By the end of the book I didn’t really feel like I came to know Questlove or The Roots any better, which is odd for a memoir, don’t you think? Or perhaps we expect too much from celebrity memoirs. We want a mirror held up to an icon, but what we get is a projection loosely based on actual events from the life of someone we may never know. This entry was posted on Friday, August 30th, 2013	at 2:11 pm	and is filed under News	. Responses are currently closed, but you can trackback from your own site.